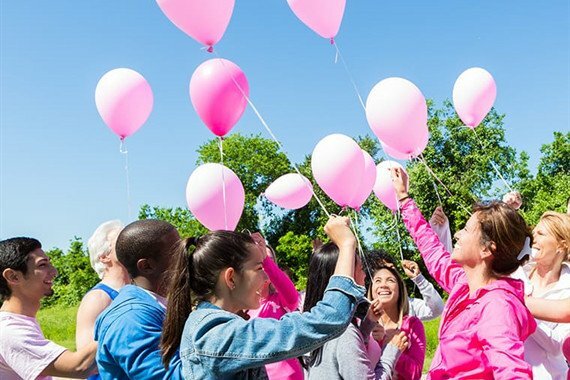 Bradford O'Keefe Funeral Homes is pleased to be engaged in a variety of on-going annual and seasonal events. We invite you to check this site on occasion to see what is planned and mark your calendar accordingly. If you prefer a more current update, we invite you to register your email with us and keep a watchful eye as we develop our social media pages. 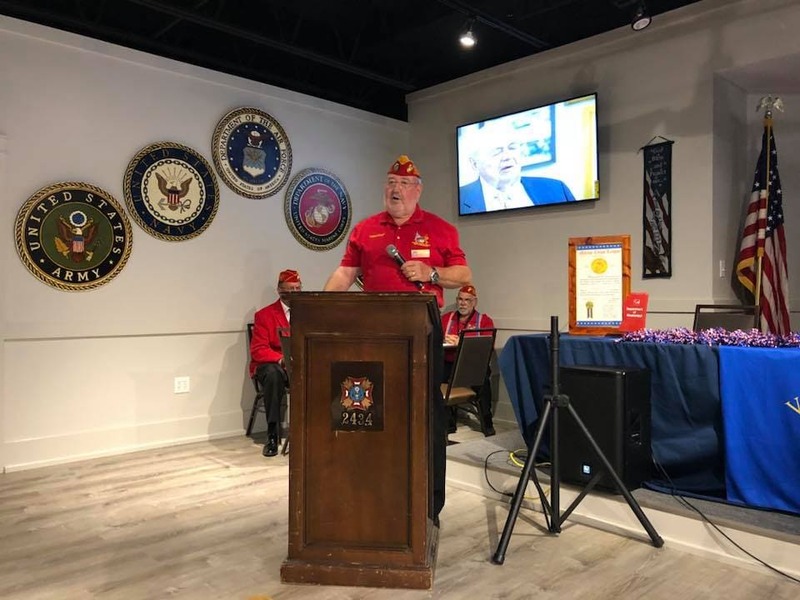 (Jeffrey O'Keefe Sr.) attended a dedication ceremony for a new Marine Corps League VFW Post (1644 Pass Road, Biloxi, MS 39531) and sends this report. 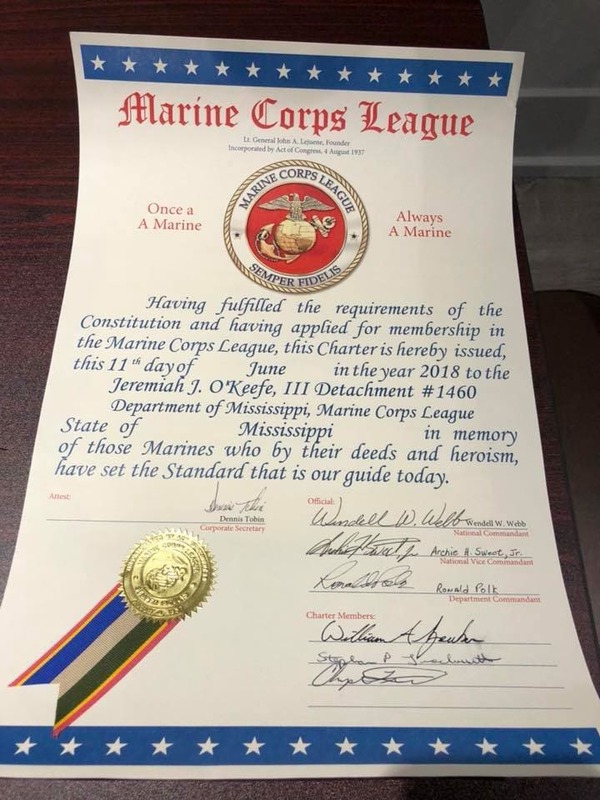 The ceremony, during which the new post was officially name after Dad, was conducted by Marine Corps League Department Commander Ronald Polk out of Madison MS. 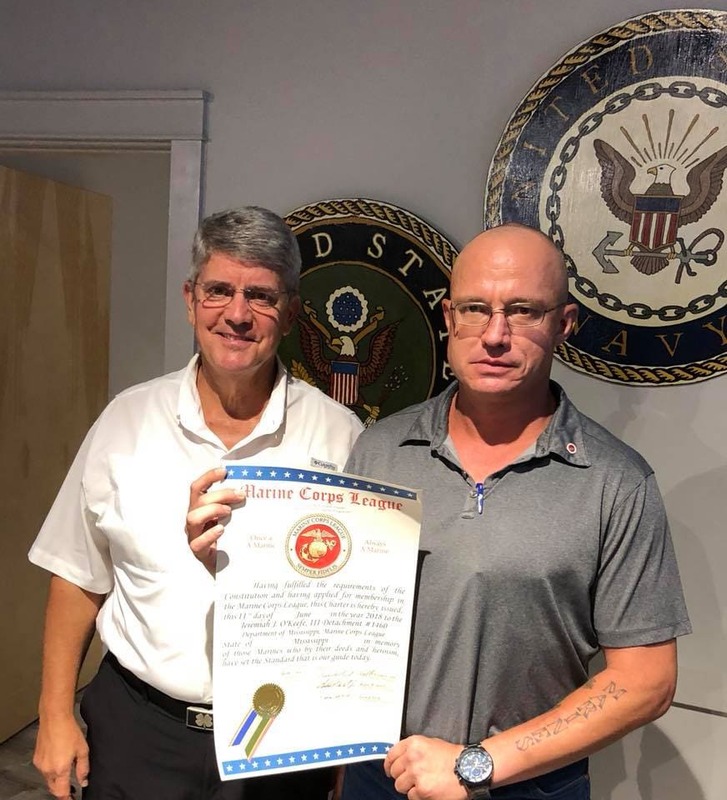 He swore in the officers for the local chapter and commended them on having in excess of 40 charter members for the new chapter. Following the formalities, Commander Polk asked if I would say a few words about Dad, which I did. I first thanked them for having me there to represent the family and our father. I then apologized for my casual attire, explaining that I was continuing a bit of a tradition that our father had begun……..and that was a larger family gathering on Sundays. I explained, for those who didn’t know Dad, that he had thirteen children and that I was the tenth of those thirteen. Our Dad would cook fried chicken on Sundays for the immediate and extended family. I mentioned that Dad had lived to be 93 and that as a family we had enjoyed many blessings over his life. One such blessing was a few years back in 2015 when we celebrated 150 years in business. I explained that Dad was involved in air combat over Okinawa during WWII and had earned the distinction of an Ace Fighter Pilot. 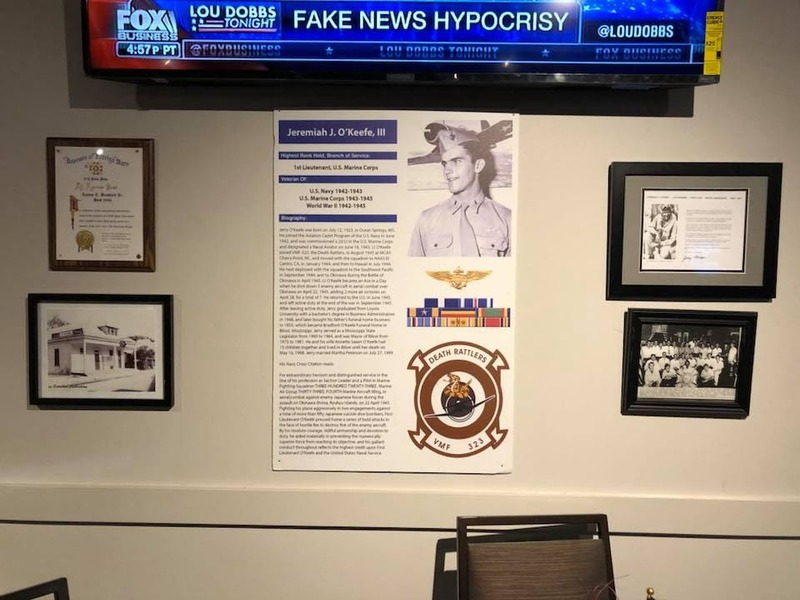 I told them that Congress had minted a Congressional Gold Medal for American Ace Fighter Pilots and in approximately 2014, Speaker of the House Boehner had extended an invitation to all living American Ace Fighter Pilots to come to Washington DC and receive this medal. 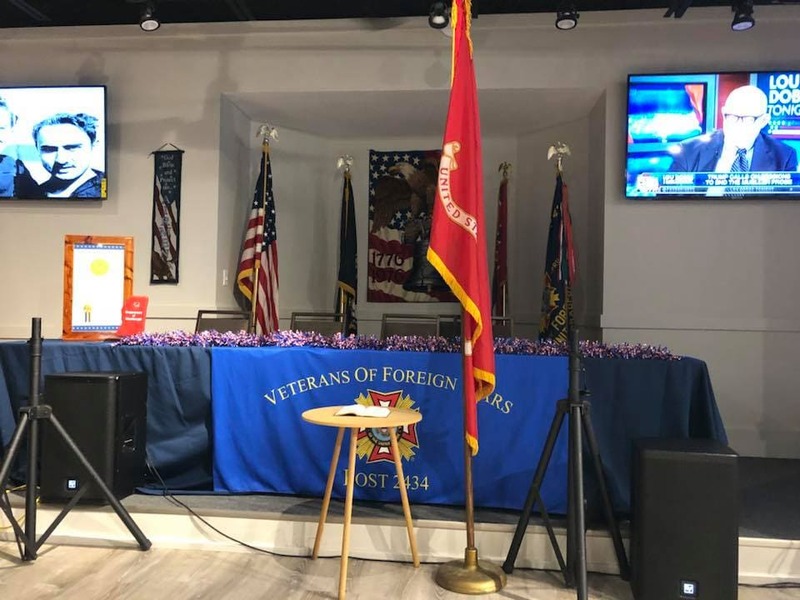 Many were not able to attend this gathering and Dad was one of those who was unable and so the Congressmen for each District began a program to get the medals out to the remaining Ace Fighter Pilots. You see in history there were slightly more than 1,400 Ace Fighter pilots or approximately 1,437 or so. In 2015, only about 83 of those pilots were still living. Our father was presented with his Congressional Gold Medal in connection with the formal celebration of the family's 150th business anniversary. It was a smoking hot humid summer day and I suggested that Dad have the ceremony inside the air-conditioned Chapel located at the site of his birth on 911 Porter Avenue Ocean Springs. He said he would rather have the ceremony out on the front porch………….So, as emcee for the gathering, I begged the attendees' indulgence while they sat in the afternoon sun for the formal portion of our gathering. Then I asked my Dad…………. 'Dad, when you were flying in that Corsair over Okinawa in combat battle……….was there air-conditioning in the cockpit of that airplane ????' He chuckled easily and suggested that there was not………..which I feel helped put the heat of the moment in perspective. For those who didn’t know Dad………I wanted to share a couple of brief stories about him. I mentioned that the History Channel had created a segment on Air Battles in WWII which featured Dad’s mission and a personal interview with him. 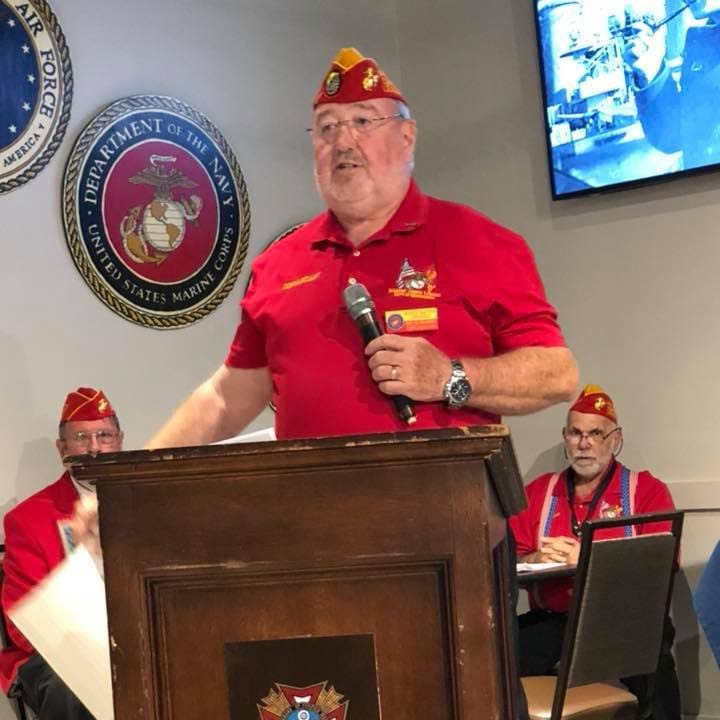 The local businessmen’s club had scheduled to show the segment at one of their weekly luncheons and had asked Dad to say a few words afterward. He told the story of having trained through a number of planes, gradually advancing to the Corsair. The Corsair sat with its nose at a pitch that you couldn’t really see over the top of it and as you might imagine that the entire front end was all engine. When you lay the hammer down with full acceleration ……….the whole plane would buzz down the runway and might drift from side to side on occasion. One day when Dad was going up for a training flight……..he laid that hammer down and the plane began buzzing down the runway. It had slightly drifted to the right when one of its wheels caught a mud puddle in part of the runway. It had been raining and the mud puddle actually flipped the plane over and he found himself and the plane sliding upside down along the runway until it came to a stop. Immediately a number of ground crew were running up hollering…..'wait right there.... we’re going to get you out of there….'. He said to himself………….I’m not waiting on anyone ……….as the gasoline from the plane was pouring out and over him! He unbuckled himself and climbed from under the plane. He said his saving grace was that……..it had been raining ………..otherwise ………his plane would have sparked and that would have been it for him…………..
Another instance was when he was taking off from the aircraft carrier……..the corsairs were lined up and the plane right in front of him was catapulted off the carrier and unfortunately went right down into the sea and broke apart………….the carrier was turned and circled to see if a recovery could be made, to no avail……….as he sat there, next in line………his engine running, his carrier control man come over to his small port window………..he looked him in the eye and hollered out…………….”Good Luck !!!! !”…………..which did not give him much comfort but nevertheless ………..he made it off ok and the rest is history. I closed by saying, as a fifth generation family member and looking back………our family has demonstrated a commitment to the defense of our country dating all the way back to the Civil War. It’s a tremendous honor to have this Post named after our Dad and it’s my intent to communicate this fact to our entire family and to support the Chapter as best we can moving forward. For more than ten years now, Crestlawn Memorial Park and D'Iberville Memorial Park Cemeteries offer a very special tribute to those loved ones who have gone before us but are not forgotten. The management and staff of these two cemeteries take very special care to prepare a remembrance service which involves placing and lighting of a memorial candle on each loved ones grave space located at these cemeteries. Prior to the sun going down at dusk, a brief but very spiritual remembrance service is conducted after which lighters are handed out for attendees to help light a candle on each and every grave of a loved one. When the sun has fully recessed, the beautiful glow of these candlelight's, create and absolutely breathtaking unique tribute. This event is lauded as one of the meaningful to those whom have been able to attend. This service is open to anyone who would like to attend. This event typically is scheduled in early December and most likely the first or second weekend of December. Please check by this webpage for the dates of this year's events, look for notices in the local newspaper, or email us your address so that we can include you. Learn valuable information and guidance on funeral planning for yourself and or a loved one. Should you or a group of any size be interested in one of our Pre-arranged Funeral Conferences, contact us at any of our convenient locations and we’ll schedule a convenient date for your group. This can include an educational tour of one of our facilities if desired. In a conference of this nature you will have all your questions answered and learn of the options available to you. It is a tremendous benefit to yourself and your family. Each year in May we honor the lives of Law Enforcement personnel who have lost their lives in the line of duty. Please check this site beginning in March for the dates to be posted of this annual event.